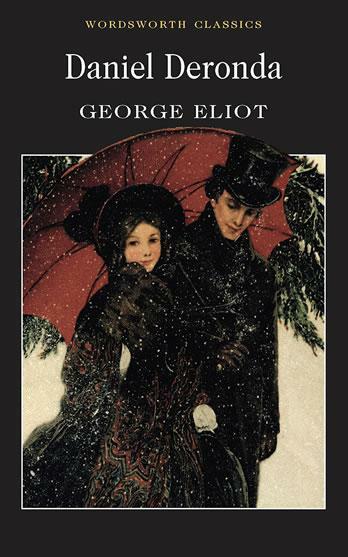 As many of you are aware, Heather chose Daniel Deronda , by George Eliot, for our August book club read. I know several of you were reading along. I'm not quite done with the book (and I know a couple of you are playing catch up as well) but I do hope you'll plough through to the end and finish it! Somewhere around page 450 of Daniel Deronda , I began to wonder if I had lost my mind when I decided to review it. After I'd turned the last page my suspicions were confirmed. Not only am I convinced that George Eliot writes for a far more intelligent person than I, but I don't really have any idea how to write this review. The review may contain spoilers. That is, you may be able to put things together by reading my review. I tried to couch things in slightly vague language in case not everyone has finished. Daniel Deronda is really two stories, pulled together by the title character, Daniel Deronda. Daniel is a young man who has lived all his life with a wealthy Englishman named Sir Hugo Mallinger. Since he was young, Daniel has assumed that he is Sir Hugo's illegitimate son. This outsider status gives him a distinct empathy both with those outside his socioeconomic sphere and with those drifting outside the moral compass. It is also reflected in how he seems shut out from the feelings those around him are experiencing. Often his friends treat him as a confessor rather than invite his confessions. Later Daniel will come into contact with a peculiar Jewish man, named Mordecai whose enthusiasm often separates him from other more moderate people. Daniel is able to see past Mordecai’s differences and connects with him in a way even Daniel can’t understand. One thread of this story is the fall from glory of the proud and beautiful Gwendolyn Harleth. At the beginning of the book, the reader encounters Gwendolyn off in Europe, gambling away her feelings for Henleigh Grandcourt Mallinger, a wealthy gentleman whom she met earlier and whose proposal she was on the verge of accepting. She was stopped at the last minute by learning that Henleigh had three illegitimate children with a woman named Lydia Glasher who confronted Gwendolyn and extracted a promise that she would never accept Henleigh. In Europe, Gwendolyn sees Daniel and seems to think he “cast an evil eye” on her gambling. Based on this encounter she begins to attach a certain mystical persona to Daniel. Gwendolyn seems to think Daniel is some sort of superior being which will come into play later. At the time of her vacation, Gwendolyn receives word that her family has lost everything and they are completely destitute. Rather than take a governess's position Gwendolyn decides to marry Henleigh. Tempted by the life of luxury for herself and the salvation from a life of teaching, Gwendolyn traps herself in a loveless marriage. After the marriage, Lydia sends Gwendolyn a set of diamonds Henleigh once gave her “with ardent love” and encloses a note where she predicts the outcome of Gwendolyn's life. “The man you have married has a withered heart. His best young love was mine; you could not take that from me when you took the rest. It is dead; but I am the grave in which your chance of happiness is buried as well as mine...you will have your punishment.” After the she receives this note and the diamonds which she is forced to wear as a constant reminder of what she has done, Gwendolyn turns to Deronda to learn how to better herself and remedy her wrongdoing. The other story is of Mirah Lapidoth and her brother Ezra, two Jews living in England where prejudices still run high. Daniel is out rowing one day and comes across Mirah attempting to drown herself. He saves her and brings her to the home of an old school friend, whose mother and sisters take care of her. He learns that she was kidnapped by her father and taken to a life on the stage, which she has run from. She is on the search for her mother and brother, and Daniel begins to help her in this search. He is successful in finding her brother, and along the way finds himself curiously drawn to the Jewish faith. This is where Mordecai enters the picture in the form of a bookseller. He has been studying all his life and is now dying of consumption and has been praying for someone of the Jewish race to enter his life so he can pour his learning into someone who would live longer. Through the search for Mirah’s brother, Daniel surprisingly ends up learning much about himself. Daniel Deronda is the story of the salvation of two women, one physically and one spiritually. It is also a story of outsiders. Lydia Glasher and her children are outside the reach of the law which does not recognize illegitimate children. Gwendolyn Harleth is outside pity for her broken heart and life, because she walked into the marriage to Henleigh with her eyes open. Daniel is outside the recognition of the law being unable to inherit Sir Hugo’s estate. Mirah and Mordecai are outsiders because of their faith. It is also the story of broken family relationships. Neither Mirah, Gwendolyn, or Daniel have whole families. Parents are missing or unknown or have abdicated their roles. It is a story filled with wonderfully whole characters. The inner lives of each person is rich and full. You feel like you not only met each person, but you've known them for a long time, by the time the novel ends. I said in my introduction that George Eliot is more interested in psychological sketches and reality. She creates a person in all their psychological eccentricities and foibles. There are some very long paragraphs in Daniel Deronda where general remarks about human nature are made. They could be a little tedious at times, but I always thought they were amazingly accurate. Lastly Daniel Deronda is the story of anti-Semitism in the early 1800s. Jews are not being actively persecuted but there are strong prejudices which are made clear in the novel. Apparently at the time Eliot was writing this book she became familiar with a Jewish mystic and lecturer. Mordecai was based off of him. Mordecai is a Kabbalist (don’t ask me, that’s just what Wikipedia says, I get the feeling it just means “mystic”) and a proto-Zionist. He dreams of a final separation into a physical promised land. He sees Daniel as his spiritual successor and wants him to carry on his dreams of a future Zion. Eventually the culmination of the novel is when Daniel has to make a choice and he will break the two strands of the story by leaving one group, and one woman behind. Now these are the parts I really had to slog through. I found a lot of the discussion of Jewish philosophy very tedious. It almost seemed like the author was learning about Jewish philosophy and ideas and really wanted to get them in her book, which is what she actually did. This is such a complete and mature book from Eliot. There are links in unlikely places that tie the novel together. When a key character drowns much later in the novel, one can't help but think of Mirah's near suicide. And the thought of Henleigh's illegitimate boy makes us consider the fate of Daniel when he believes he is the illegitimate son of Hugo Mallinger. Daniel's mother, when she finally contacts him, says she is incapable of love, bringing to mind Gwendolyn's avowal that she should never love anyone. There are other links I’m sure, but those are the ones that stood out to me. read what other people think of it. One note on the Hugh Dancy movie version of Daniel Deronda . Structurally it follows the book and much of the story is the same. Unfortunately, the movie can’t quite convey the inward lives of the characters in the same way that Eliot can, which is to be expected. And the movie camps much more on the romance aspect of the book. They picture Daniel as torn between Gwendolyn and Mirah, which is true, but in the book it’s less because he’s in love with both, and more that he is torn between the two worlds embodied by these two women. I’m not even halfway through this THREE AND A HALF HOUR LONG movie, but I’ve already had a few moments of being grumpy over some of the treatment of the story. Did you read along this month? If so, and if you've written up a blog post sharing your thoughts, please link your blog post in the comment section below. If you read along but do not have a blog, please also feel free to join in the conversation below. I'm still reading but should be done in a day or two. I'm looking forward to reading what everyone else got out of it! I would like to read this "someday". Instead of reading this one, I have been working on Silas Marner by the same author because 1) I own Silas Marner (instead of Daniel Deronda), 2) I have never read Silas Marner and I've heard a lot about it. It's quite good, I've just been extraordinarily busy and can't seem to get time to finish it. Silas Marner is also good, although not as deep as this one. It is, however, much shorter, and is a good introduction to Eliot.